Ayesha and Vincent of Merry Maui Weddings produced a beautiful wedding recently at the awesome Royal Lahaina Villas venue. 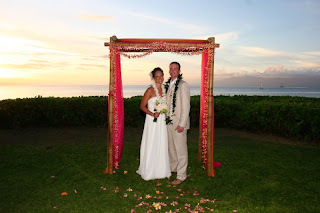 Today's Lucky Bride enjoyed perfect weather and another outstanding tropical sunset. 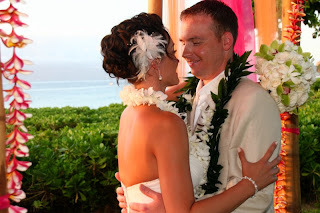 Her bouquet, a Dellables creation, along with her orchid lei and his woven ti lei accented everything wonderfully. 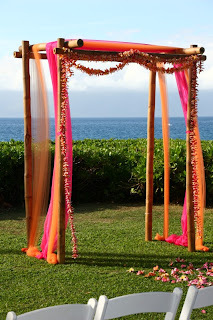 The bamboo chuppha arch was decorated in orange and green fabric draped with rainbow plumeria leis. 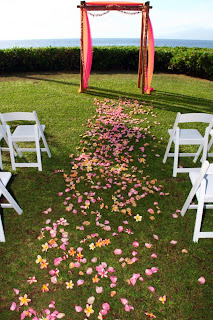 A floral petal path led the way to this very popular Maui - style alter at the sea!